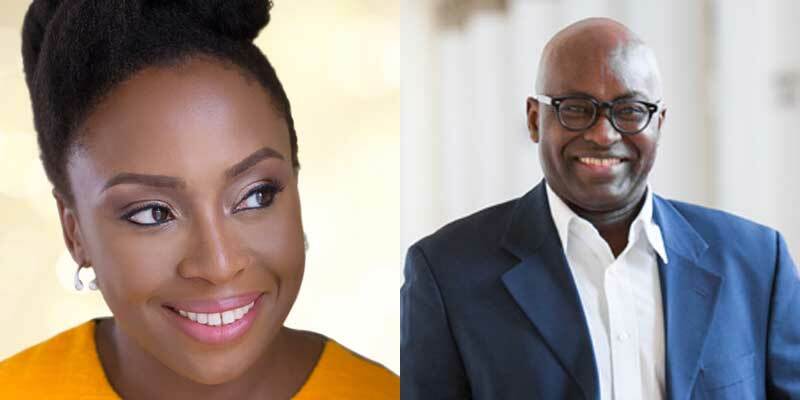 Chimamanda Ngozi Adichie and Achille Mbembe are two of the speakers at this year’s Frankfurt Book Fair 2018. This festival to take place in Frankfurt, Germany from October 9-14 will feature a large number of African delegates in all segments of the literary business. The Frankfurter Buchmesse, popularly known in the English speaking world as the Frankfurt Book Fair, is the world’s largest trade fair for books, based both on the number of publishing companies represented, and the number of visitors. The fair started in 1454, you heard that right – 5 centuries ago, soon after Johannes Gutenberg had developed printing in movable letters in Mainz near Frankfurt. This year like has happened in the last five hundred plus years, the world of publishing will converge on the German city to share and deal to their hearts content. This year there will be a very large delegation of the African extraction presenting their views on a variety of topics. There will be publishers and authors from 19 African countries at this showcase; Angola, Benin, Burundi, Cameroon, Congo, Cote D’Ivoire, Ethiopia, Gabon, Ghana, Guinea, Madagascar, Mali, Mauritius, Nigeria, Rwanda, Senegal, South Africa, Togo, and Zimbabwe. The array of authors and other publishing professionals who will feature at the fair is mind boggling to say the very least starting with a keynote address by Chimamanda Ngozi Adichie at the opening press conference. Also featuring at this Africa rich festival are Cameroonian historian and political scientist Achille Mbembe, Zimbabwean author and filmmaker Tsitsi Dangarembga, Noma Award for Publishing in Africa winner Meshack Asare, Hargeysa International Book Fair founder Dr Jama Musse Jama, and many many more. Below is the Africa program of the events that will happen in a few days in Frankfurt, Germany. Inauguration: African books for a sustainable knowledge (Frankfurt 1980-2018). Furaha Publishers (Christine Warugaba), Dodo Vole (Sophie Bazin), Atelier de Nomades (Corinne Fleury). International partnerships in African Publishing. Brian Wafawarowa (International Publishers Association, South Africa), Katja Petrovic (Bureau International de l’Édition Africaine, France), Ernest Oppong (African Publishers Network, Ghana), Lily Nyariki (Association pour le Développement de l’Éducation en Afrique, Kenya). Discussant: Stephanie Kitchen tbc (English). Indaba Marketplace: Meet African publishers. Children & Youth Publishers: Echoing & picturing the World. Corinne Fleury (Atelier des nomades, Mauritius), Marie-Paule Huet (Ganndal, Guinea), Yasmin Issaka-Coubageat (Graines de Pensées, Togo), Akoss Ofori-Mensah (Sub-Saharan Publishers, Ghana), Dr Kidi Bebey (France, author of Miriam Makeba, la reine de la chanson africaine, Cauris Livres: Mali). Élodie Comtois (Écosociété, Quebec/Canada), Yasmin Issaka-Coubageat (Graines de Pensées, Togo), Dr Carles Torner (Executive Director, Pen International, Spain), Prof. Dr Anne-Marie Voisard (sociologist and author of Le droit du plus fort. Nos dommages, leurs intérêts, Ecosociété Publishing, Quebec/Canada and author of the current study “Freedom to publish”, International Alliance of Independent Publishers. Rights in African Languages: Promoting networks and exchanges to facilitating trade. African Books Collective (Justin Cox), Presses Universitaires d’Afrique, Cameroon (Serge Kouam Dontchueng), Youscribe (Juan Pirlot De Corbion). Sulaiman Adebowale (Amalion, Senegal), Prof. Dr Kum’a Ndumbe III (AfricAvenir, Cameroon), Prof. Dr. Manfred Loimeier (Universität Mannheim, Germany). Discussant: Dr Madhu Krishnan (University of Bristol, UK)(English). Asserting & connecting identities: African book fairs and literary festivals. Dr Madhu Krishnan (Writivism, Uganda), Dr Jama Musse Jama (Hargeysa International Book Fair, Somali), Elliot Agyare TBC (Ghana International Book Fair), Dr Ibrahima Moctala Lô (Foire Internationale du Livre et du Matériel Didactique de Dakar), Ruth Kumpmann tbc (Frankfurt Book Fair, Germany), Corinne Fleury (Foire du livre de jeunesse de l’Ile Maurice). Writing in Transition –African literature in transition. North-South linkages, value chain and the rise of literary agents in the literary field. Pierre Astier (Literary Agency Astier-Pécher, France), Manfred Metzner (Das Wunderhorn, Germany), Ibrahima Aya (Tombouctou publishing, Mali), Dr Kenza Sefrioui (En toutes lettres, Morocco), Corinne Fleury (L’atelier des nomades, Mauritius), James Noël (author, editor in chief IntranQu’îllités, Haïti). Discussant: Corentin Emery (English/ French). Feminist Press reversing the gender bias. Colleen Higgs (Modjaji Books, South Africa), Mirline Pierre (Legs éditions, Haïti), Anne Migner-Laurin (Les Éditions du remue-ménage, Canada). The Chain of Knowledge Media Coverage of African Publishing. Madhu Krishnan (Wasafiri, UK), Olatoun Gabi-Williams (Borders Literature for All Nations, Nigeria), Angus Phillips (Logos/Oxford International Centre for Publishing Studies, UK), Acèle Nadale (Afrolivresque, Germany), Porter Anderson (Publishing Perspectives, USA). Portuguese: Universial Language or an annoying remnant from Colonialism? Panel discussion with Michael Kegler (German/Portuguese) (Kalaf Epalanga, Isabela Figueiredo and João Paulo Cuenca). African Comics: Extending styles(in partnership with Africa & Mediterraneo). Paulin Assem (Ago Media, Togo), Dan Bomboko (Elondja, DRC), Simon-Pierre Mbumbo (ToomComics,Cameroon/France), Ngong Bertrand Collins (AfricAvenir, Cameroon). Discussant: Christophe Ngalle Edimo (Toom Comics, Cameroon) (French). Olatoun Gabi Williams Talks to Antoinette Tidjani Alou -Author, Tina Shot Me Between the Eyes & Other Stories (Amalion, Senegal). Discussant: OlatounGabi Williams (Borders Literature for All Nations, Nigeria)(English). Opening the gates: African literary awards and African publishers. Isabelle Kassi Fofana (Prix Ivoire pour la Littérature Africaine d’Expression Francophone, Ivory Coast), Akoss Ofori-Mensah (Sub-Saharan Publishers, Ghana: publisher of Meshack Asare, winner of the Noma Award for Publishing in Africa 1982), Myriam Senghor-Bâ (Prix des 5 Continents de la Francophonie, France), Maggie Davey (Gerald Kraak Award, South Africa), Pierre-Cresus Gbado (Ruisseaux d’Afrique, Benin: winner of the Alioune Diop Award for African publishing 2002). Panel discussion with Prof Dr Achille Mbembe (Cameroon/ South Africa), Michelle Münterfering (Germany), Nadja Ofuatey-Alazard (Germany). Please note: This blogger will be attending this fair courtesy of the German embassy in Kenya so expect loads of content on this blog, Internet willing, and social media channels. Thus if you want your timeline flooded with literary goodness I recommend that you follow us on Twitter (@jamesmurua) and on Instagram (@jamesmurua). Previous Previous post: Brittle Paper Awards 2018 Shortlists announced. Next Next post: Tomi Adeyemi makes Kirkus Prize 2018 shortlist.